pecifications to comply with all ATA competitions. They are set on a small arc to concentrate the shot fall zone to a smaller area thereby making lead recovery easier and more efficient. We will install the traps as needed by the membership. Therefore, we have started with one trap and will add more as the need arises. We have the ability to have a total of seven traps. Our idea is to make the range friendly to instruction and to competitive shooters. This will be done by our instructors and the fact that we are willing to set traps for any special problem that a competitor may have the need to practice. Trap is a game that is shot with shotguns using clay pigeons as targets. A trapshooting round is normally made up of 25 birds or 25 pairs in the case of a doubles round. The birds are thrown at various angles anywhere within the 44 degrees field. The shooter does not know what the angle will be. 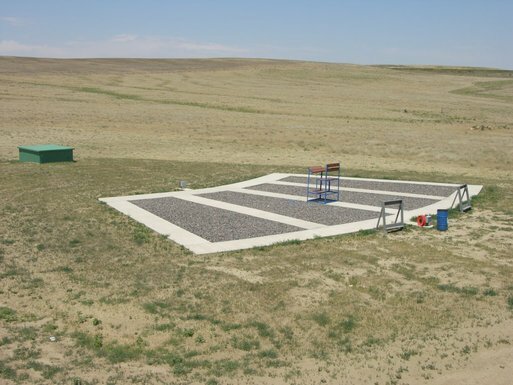 There are three types of trapshooting: 16 yard singles, handicap, and doubles. In a 25 bird “singles” round, the shooter fires at five targets from each position before moving to the next. This game, like all our shotgun games, is open to the public on weekends.